Stunning Ring from Fado Jewellers in Wicklow! Made in 14 Karat Yellow Gold and featues a .25 Carat Brilliant Cut Diamond. The Celtic Knots are a symbol of Strength and Protection. This is a ring for the ages - made with exquisite care and attention. A family heirloom piece of jewellery! The rings are Hallmarked by the Irish Assay Office in Dublin Castle- the Assay Office was established in 1637 and has been protecting consumersfor almost 380 years! Price includes Worldwide delivery with any potential import duties pre-paid- you just pay the price shown - no surprise costs! 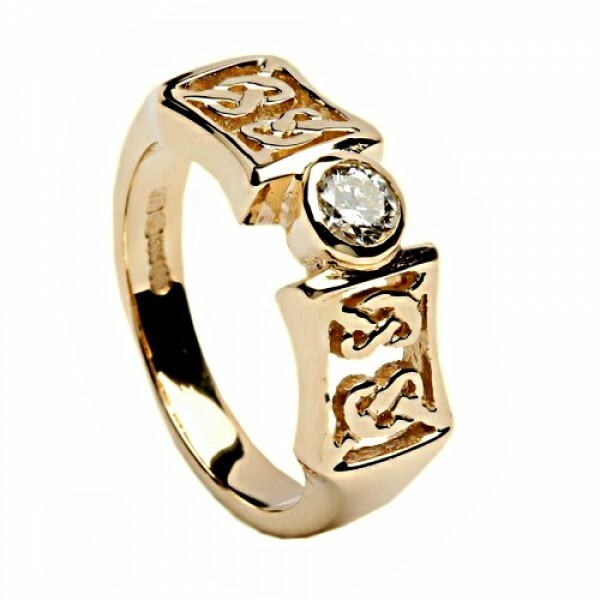 This is a beautiful Claddagh Ring made in Ireland from 14 Karat Gold. It has the classic features..
A Classic Irish Wedding Ring! From the An Rí Collection - it symbolises the Journey of Life and..